Welcome to Varengold’s Daily FX Report. Today, the South pacific will be at the main focus while the RBA signaled an economic upswing, which makes the nations’ assets popular. Anyways, we hope you will have a successful trading day. The AUD climbed after RBA Deputy Governor Ric Battellino said the economy has entered a “new upswing”. His comments fueled speculation that policy makers will raise interest rates next week. The NZD also climbed as data showed that Japan’s exports improved last month. That supported gains in regional stocks and other high-yielding assets. Japanese shipments abroad dropped 23.2 percent in October from a year earlier, compared with a 30.6 percent decline in September. The AUD/USD climbed to a high at 0.9264, recovering from the week’s low, which was at 0.9061. The NZD/USD also rose after it reached a high at 0.7289 from an opening at 0.7283 while trading currently around 0.7280. The USD/JPY fell for a second day after falling to a low at 88.20, which was the lowest price since October 8th. Benchmark interest rates are 3.5 percent in Australia and 2.5 percent in New Zealand, compared with 0.1 percent in Japan and as low as zero in the U.S. It attracts investors to the South Pacific nations’ higher-yielding assets. One risk in such trades is that currency market moves will erase profits. 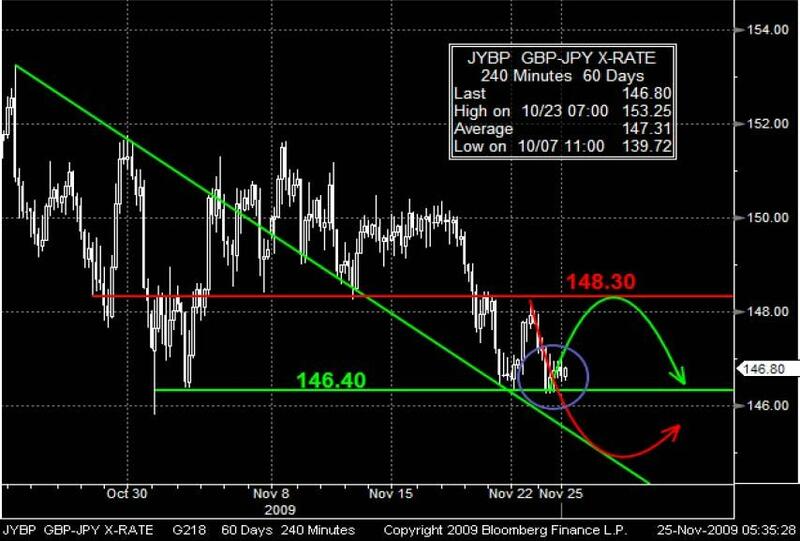 As you can see the GBP/JPY has been trading along a bearish trend line with a support level around 146.40 and a resistance point around 148.30. The market is currently trading around the support level of 146.40. If the market breaks the support line, it may cause further losses and get support on the bearish trend line. If not, it may rise to get resistance around the 148.30 level. 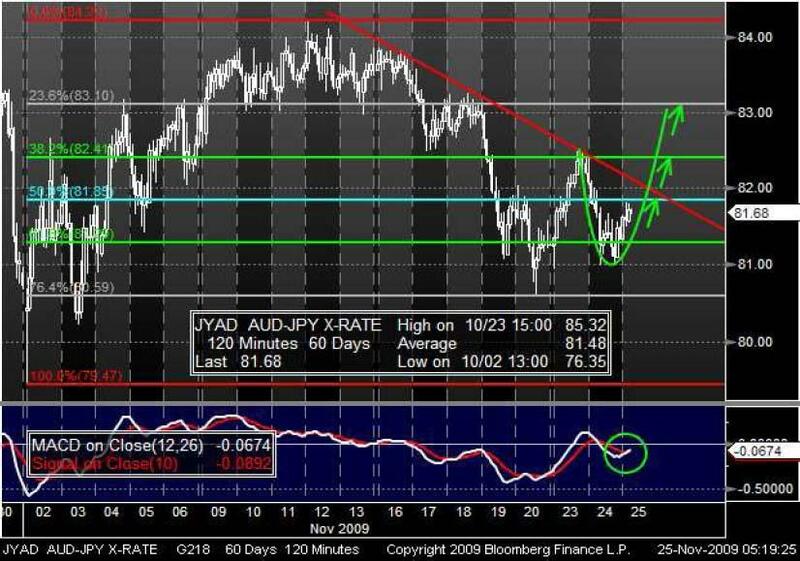 The MACD may signalize a trend reversal in the next time on the AUD/JPY market. As you can see it has been moving along the Fibonacci retracement lines and a bearish resistance line. If the market breaks the 50.0% level around 81.85, it may cross the bearish trend line and gain towards the next Fibonacci resistance levels around 82.41 (38.2%) and 83.10 (23.6%).